We have been conducting training with this incredible group of potential Sweet Dreams ice cream employees, and they think like experienced businesswomen, not novices. They have already developed marketing strategies, how to get customers, job descriptions. They did the whole plan! Today was about business finance. They answered critical questions. They were at the ready with how much the milk cost, transportation costs, etc. And when we gave out the Bpeace calculators--it was all over. They were figuring out the profit, the pricing, the cost of the soda, how many sodas they had to sell to break even and how many for a profit. They may not generate a million jobs, but by the time these divas start spreading their new-found knowledge there will be one million jobs somewhere in Rwanda. 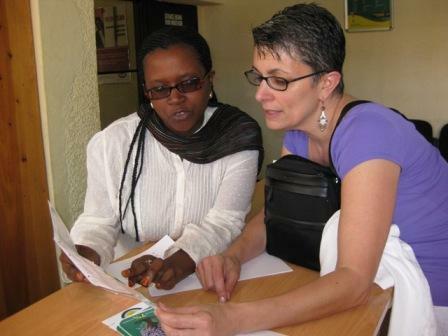 Meanwhile Fran who is as wild as I am (two Brooklyn people in Rwanda, not a good thing) went to the bank while I was conducting the business finance training. Sabra’s presentation was sensational today. The Rwandan women know so much but, like many women in the US, have very limited access to resources, especially capital and assets and hey, when you are talking about money, what else it is there? As a result of Sabra’s training and several conversations and observations I decided it was time to introduce them to a bank and the concept and importance of establishing and building a relationship with a banker. These are smart women-they know how to manage and track money-they simply need resources and access to asset building tools! So, I asked Kiki to take me to the most friendly community bank in Butare. We went to Banque Populaire Du Rwanda on Avenue des Forces Amees-where Kiki’s mom once worked. We actually went three times…because the person we needed to speak to was not there and guess what? You can’t make an appointment…so back and forth we went. We finally had the pleasure of meeting Angelique Uwamahoro who is the Customer Care Director. Kiki and I had planned to pitch the bank for reduced fees and rates for potentially 17 new customers. We went in expecting that the customary fee for maintaining an account was $6 per month which is what the commercial banks charge in Rwanda. So I was planning on negotiating a deal for our women. I am not a believer but I might just become one after this trip because I tell you something mystical is happening here. How is it that we picked the one bank in Rwanda that DOES NOT CHARGE FEES? And where you can open a new account with only 3200RWF (about $5.56US)? The only fee they have is for direct deposit which is 500 RWF per month or $1US. I was so excited I could not contain myself in the bank! Angelique was pretty excited too. Bringing new business to the bank is her job, but she was especially excited to learn about Bpeace and to play a role in helping these women on the road to financial security. When I asked her to come in and speak to the women face to face on Friday and explain banking basics to them she was thrilled. She will discuss with them how direct deposit works, how they will earn interest on their money, and the different types of savings accounts they offer. Kiki and I walked back to the classroom beaming at our accomplishment. This is a very new resource for these women. An added bonus is introducing them to Angelique, a successful role model from the banking community who will, of course become a customer at the Sweet Dreams ice cream store and hopefully a long term financial partner for the women. I am so looking forward to Friday’s guest speaker on personal finance. Divine intervention I tell you--my Brooklyn girlfriend may make a believer out of me. The owner of the restaurant where we have lunch everyday has excellent marketing tools and customer service. How he started the business is remarkable. I asked him if he would speak at the business club that the Race for Innovation students started. He was so excited, so the club is going to meet with him tomorrow. When we leave, I know there will be more Bpeace chatter. This what I want every Bpeace member, friend and donor to know, that a collaboration like this can impact an entire town!